Today, let’s take a close look at one of the better-known pages of this important manuscript, which was produced around 325: the page that contains the first chapter of the book of Hebrews. I will simply list twelve features on this page, and describe them one by one. 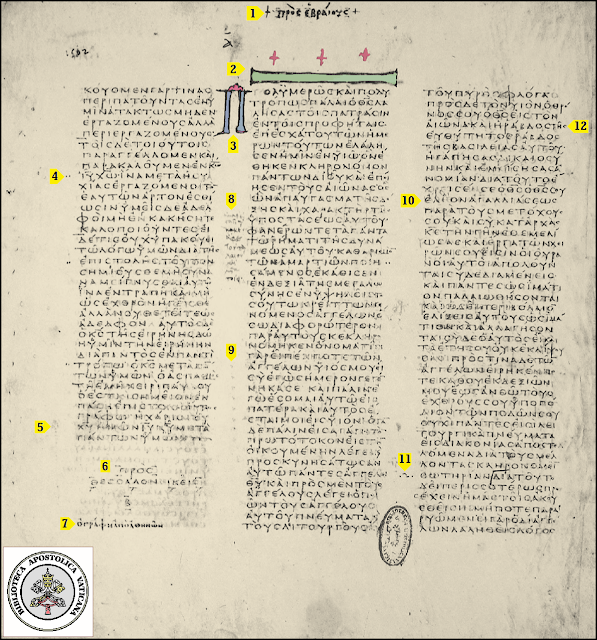 First, though, for those who might want to explore Codex Vaticanus’ pages directly, here is an index of the online images of the first page of every New Testament book that is included in the manuscript, in the order in which they appear in Codex Vaticanus. Clicking the embedded link will take you to the image of that page at the Vatican Library’s website. From Codex Vaticanus: Second Thess. 3:11-18 and Hebrews 1:1-2:2.
is at the Vatican Library website. 1. Book title, in the upper margin of the manuscript. 2. Decoration. Similar decorative lines are not unusual in later manuscripts, which sometimes feature horizontal lines made of braided ropes or thorns. In this case, the decoration was added long after the initial production of the manuscript. Such decorations serve a practical purpose as well as an artistic one, helping draw attention to the beginnings of books. 4. Distigme. The two dots in the margin which resemble an umlaut (¨) seem to have been added to draw attention to a textual variant in the text. In some other manuscripts, margin-notes similarly draw attention to textual variants, but they usually mention the alternative reading. Probably whoever added these symbols to the pages of Codex Vaticanus (and there are wide-ranging opinions about whether these marks are ancient, or medieval, or even Renaissance-era) possessed another volume in which the same points of textual variation were marked, with notes about the readings in Codex Vaticanus. More distigmai appear on this page (for example, at Hebrews 1:3). 5. Coronis. Barely visible, a simple decorative design here, made of dots and flourishes, designates the end of a book. Early copyists tended to use their own distinct designs, so the occurrence of different designs in the same manuscript is a clue that more than one copyist contributed to its production. The remarkable similarity between a coronis-design that appears repeatedly in Codex Vaticanus (for example, at the end of Genesis), and a coronis that appears in Codex Sinaiticus (at the end of Mark), has suggested to some researchers that the same copyist was involved in the production of both manuscripts, possibly as a normal copyist for Vaticanus, and as a scriptorium-supervisor for Sinaiticus. 6. Subscription. This is the closing-title of a book – in this case, Second Thessalonians. 8. Secondary Corrector’s Note. Made somewhat famous by Bruce Metzger in his 1981 book Manuscripts of the Greek New Testament: An Introduction to Palaeography, this note was written by someone who had discovered that someone had corrected an erroneous reading. The copyist of Codex Vaticanus had written Φανερων in Hebrews 1:3, and a corrector had replaced that with the correct reading, Φέρων (which is supported by all other manuscripts, including Papyrus 46). The person who wrote this note, however, objected to this correction, and wrote, ἀμαθέστατε καὶ κακέ, ἂφες τὸν παλαιόν, μὴ μεταποίει. Metzger translated these words as, “Fool and knave, can’t you leave the old reading alone, and not alter it!” Another rendering: “Untrained troublemaker, forgive the ancient [reading]; do not convert it.” He re-wrote Φανερων, erasing most of the corrector’s Φερων. Apparently, the note-writer regarded Codex Vaticanus as a museum-piece to be protected and preserved, rather than as a copy of Scripture to be used as such. 9. Diple-marks. The “>” symbols in the margin accompany quotations from the Old Testament – in this case, quotations from Psalm 2:7 and Second Samuel 7:14. 10. A Correction. The copyist of Codex Vaticanus appears to have written ελεον, but the person who reinforced the otherwise faded lettering throughout the manuscript declined to reinforce the second ε (epsilon), and either he or another corrector wrote above it the correct letters, αι. See also the insertion of the letter ε in λειτουργοὺς in verse 7, in the last line of the second column on this page, and the lack of reinforcement of the letters ε and ν in εχρεισεν in verse 9, in the tenth line of the third column. 11. Modern Chapter-number. A relatively recent owner (or steward) of the manuscript wrote the modern chapter-number directly on the page in the margin, and crudely but clearly delineated the chapter-division in the text. It is sometimes claimed that no textual variants that are closely contested have an impact on Christian doctrine. In Hebrews 1:3, however, most Greek manuscripts affirm that Jesus, by Himself – δι’ αὐτου or δι’ ἑαυτου – cleansed our – ἡμων – sins. This unquestionably impacts the interpretation of the verse: is there room for any other source of purification of sins – for instance, is it valid to seek purification through one’s own works, or through the intercession of Mary or of other saints – or was purification from sins fully obtained by Christ, and by Him alone? And, did Jesus achieve the forgiveness of the sins of all people (as the American Bible Society’s 1976 Good News Translation says: “after achieving forgiveness for the sins of all human beings”), or forgiveness for the sins of believers (as the New Living Translation says: “When He had cleansed us from our sins”)? Does this verse teach that atonement was provided solely by Christ? And does it affirm that the atonement covers believers, or does it allow the belief that the atonement covers all people in general? It is possible, of course, to find answers to questions about the sufficiency of Christ’s sacrifice, and about the range of His atonement’s effectiveness, elsewhere in the New Testament, and that is what is meant (or, what should be meant) by those who say that closely contested textual variants do not have an impact on doctrine: if one were to simply ignore the verse in which the textual contest takes place, the doctrine which one might, or might not, find in that verse is affirmed elsewhere in the New Testament. However, the fact remains that some textual variants do have an impact on the interpretation of specific passages of the New Testament. I found your second translation of the scribal note intriguing. I never thought of it's meaning beyond what Metzger said until now. If one reads ἂφες as "forgive," might τὸν παλαιόν not refer to the "ancient (scribe)," rather than "ancient (reading)"? That is, instead of respecting the text, the writer of the note was respecting the talent of the original scribe.